Unlike a lot of ITX cases, the Shift X is a tall glass of water. The case towers 26.1″ or 663mm when used in the upright position. The lines and the style scream Evolv from top to bottom. The front and back of the case have thick aluminum panels, and sides have smoked tempered glass panels. The front of the case has a very clean design like the other Evolv’s. There are vents on the side of the case the front and the rear panel. The vents on the Shift X are wider than other cases in the Evolv line up, I’m not anticipating airflow being an issue in the case. There is very minimalist branding on this case. The back of the case has a pass through at the top for all your I/O cables. 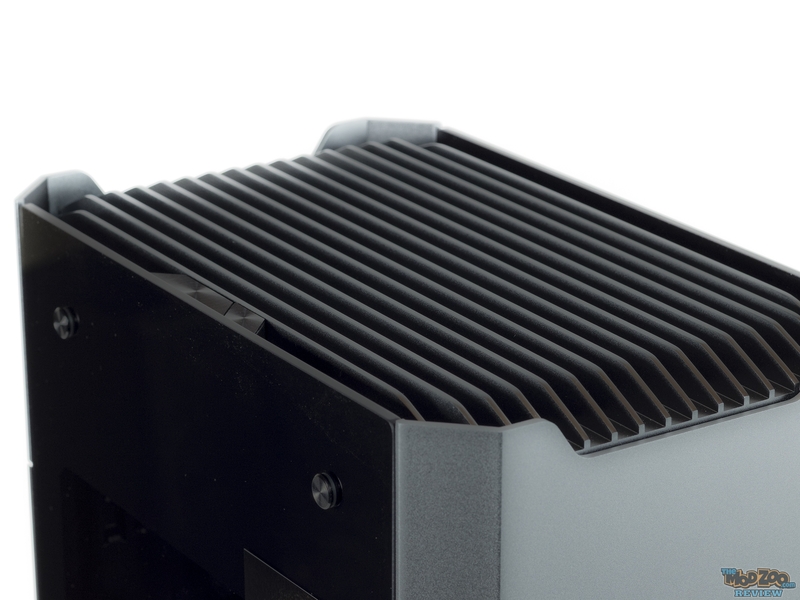 The bottom has a cut out for the power cable for your PSU. Phanteks gave the Shift a very clean look, and that is evident on the top of the case. The top of the case is vented and filtered, and just has 2 buttons on it. The big one is the power button, and the small one is the RGB controller. Thanks to the springs in the top panel, just a simple push will gently swing the panel open for easy access to all the I/O options. The top panel also conceals the captive thumb screws that hold the four panels to the case. There are two (2) captive thumb screws for each panel. With the thumb screws out, each of the panels can be removed by just pulling up and away. Thumb screws are not the only things that keep the panels in place. All the panels have stand offs that slide into the hooks built into the case. Each panel is secured from the top and the bottom.